UPDATE: The driver in this tragic crash has been identified by news outlets as 17-year-old Marcus McKay of Bremerton. In a court hearing Monday, McKay told deputies that he was driving 75 mph in a 45 mph zone and had smoked marijuana approximately one hour before the crash occurred. He is facing vehicular homicide charges for his role in the collision, which took the lives of three teens. 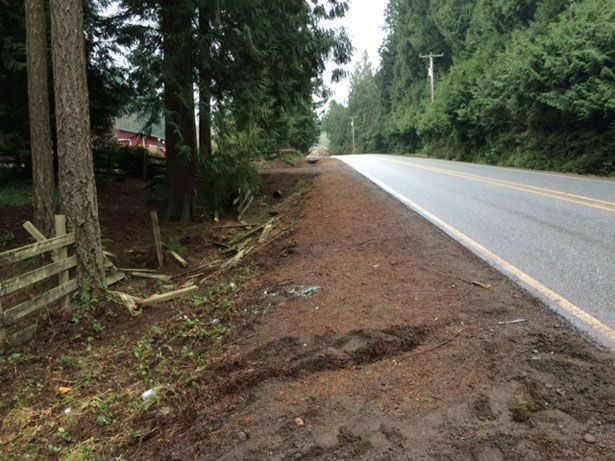 ORIGINAL STORY: Kitsap police claim that three teenagers were killed in a high-speed single-vehicle car accident on Seabeck – Holly Road NW near Seabeck very early Sunday morning. According to KOMO News, police received multiple reports from residents reporting a loud crash in the area just after 3 a.m. Sunday. A passerby called 911 after finding a 1996 Toyota Corolla upside-down in a ditch on the side of the roadway. Police arrived at the scene and found the vehicle heavily damaged on its roof in a ditch, and witnesses told reporters that the impact caused two of the teens to be ejected from the vehicle. All three passengers – two minor females and one adult male – were pronounced dead at the scene of the collision. The deceased were identified as 14-year-old Jenna M. Farley, 16-year-old Kassidy Miranda Clark, and 18-year-old Luther James Wiggins-Stoudermire. The 17-year-old driver of the vehicle – who has not yet been identified by police – survived the crash and suffered minor injuries, according to Kitsap County Deputy Scott Wilson. The teen was taken to Harrison Medical Center in Bremerton for treatment and was then transported to Kitsap County Youth Services Center where he was booked. Investigators discovered that the four teens had recently left a party they attended together in the Seabeck area and were searching for a location to watch the sun rise. Police were authorized to take a sample of the driver’s blood as part of their investigation into contributing factors. After the sample is analyzed by a laboratory, police will be able to determine if drug or alcohol impairment was a factor in the crash. Early reports suggest that speed was a contributing factor, which could be substantiated by the severity of the collision and the fact that the vehicle had completely left the roadway. All of these details could ultimately affect any criminal charges that the driver may eventually face. The driver is expected to make a court appearance early this week, reportedly as soon as Monday afternoon.